Rather than design a purpose built board I have gone for the very capable Beaglebone and added a simple battery interface comprising a resistor divider network and a few multichannel 16 bit A/D chips to convert the battery cell voltages to a digital signal, this gives a resolution of around 1mV for a 24 volt battery bank. Battery current can also be monitored with the addition of a shunt and two small resistors. 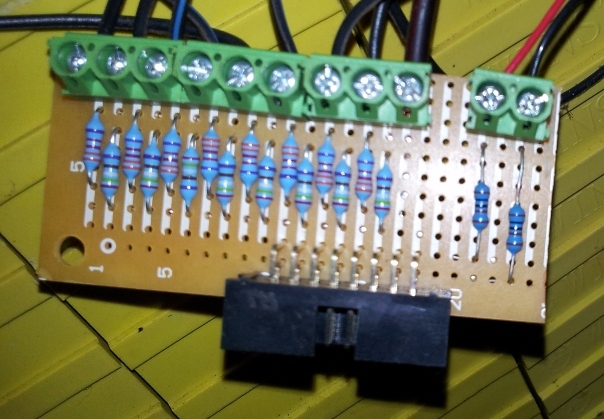 The project does not require special soldering skills and could be bread-boarded except for soldering a connector on to a A/D PCB that is available if you don't want to solder the A/D chip with its 0.5mm pin spacing. The only word of WARNING I have is that anyone who is not aware of the dangers of connecting up wiring to high power battery banks should not do it! Currently the program just logs to files, but it would be easy to extend this to generating web-pages for display over the internet. It is also a fairly trivial exercise to have the Beagleboard produce alarms to drive safety relays or maybe even send texts to your mobile phone. My primary use of this device is to monitor my LiFePO4 battery bank and provide me with information via the internet on the battery state when I am away from home, and also log the battery data over a long period of time so I can see how good or bad these batteries really are over time. It is more than likely that this project will develop into a full power management system. I have had this up and running for a little while and found it to be very useful, hopefully it will be useful to others. Wow! Thanks for sharing. And writing it in Python! Thanks for the thumbs up. Hopefully my first attempt at writing in Python is decipherable! Your feedback would be appreciated. My design days date from the time where every machine cycle and byte of memory was sacred. Getting used to the new regime of processors running at speeds in the GHz and having megabytes of memory takes a bit of getting used to. I am still amazed that a single board computer running a complex operating system can work well running a real time application. I must say that I am suffering from withdrawal writing in machine code and Forth. Ill take a look over yours when i get a moment and see if theres useful collaboration to be had. I won't be much help as my high-level language programming consisted mostly of shell script grep/sed/awk. I never did graduate to perl, or other high level languages. What is amazing is that what used to be run on a massive machine or really costly workstation I can now run on a thumbdrive. Knoppix typically. Still blows my mind. I was not aware that you were working on this. I have looked at your very good web page on your solar set-up but didn't look at any of the side links. Looks like you have been working on the web integration side of things which is one area that I am interested in. I suppose the main difference between our approaches is that I am getting the data directly from the battery where you are integrating it from the other equipment. Thanks for letting me know about your project, I will investigate further. Very cool! I've got a 'Roll Your Own' BMS but it uses embedded PIC controllers and C instead of a full blown Linux OS but can use data collected from Linux TCP/IP DAQ clients. Theres a few people on the midnite forum who periodically throw some energy at blackbox, but its moving slowly. So far the focus has been on talking to RE gear, but the plan is to make something modular that could eventually talk to anything. The current thinking (for further prototype development) is to pair the ARM board with a atmel/arduino class device to manage sensors and radio links. Various of us have put together our own systems, out of necessity, but i was hoping that we might some of us anyway work together to try to advance this project. In total theres quite a bit to it. My own priority is focused on tuning the linux os to better manage its flash storage life/ long term system stability. Theres another guy who is currently doing some work on the UI. And a pair of guys with an interest in the ADC/wireless sensors. But we all of us have time constraints. I hope we can stay in touch and i also am studying your stuff. Looks nice with that precision ADC. A special interest of mine is to monitor insolation independently of controller throughout, so as to get a realtime measure of power available for oppurtunity loads. This is the same reason why I really started learning the whole bunch of Arduiono/RPI/ Beagle bone/Cubie truck. Happy to see your opensourced system, I will take a look and see how hard it is for me to try yours and further help. and we capture data from a number of different solar charge controllers, grid-connect inverters, industrial switches and can run on a Raspberry Pi, and other ARM based computers that run Debian or BSD and Java. 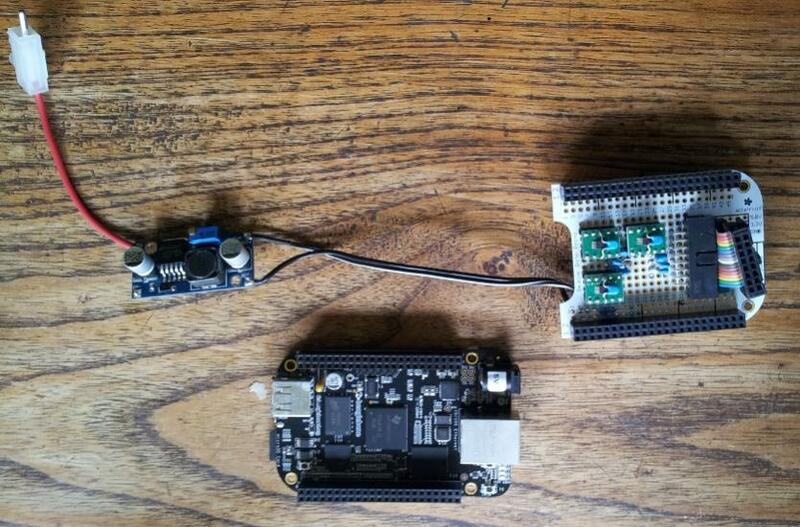 We look forward to using the BeagleBone Black! clearly there is a lot of potential in storing solar energy in LiFePO4 and releasing it judiciously. Do you have a website or some higher level docs, quick start like? The docs appear extensive, but assume you know what the thing does. The ADC is working well, for the current monitoring I have two channels in differential mode hooked up to a 50mV, 200A shunt which if my calculations are correct gives a resolution of around 30mA, also works well for current in both directions. Cool. Looks like progress! keep going, there's a lot of great stuff to do with that data I'd say. We'll have some updates and additions to this site soon...For a user, it's really easy to add new components to a SolarNode. You just boot up with the standard SD media, and navigate to the GUI interface just like a DSL router or modem with a browser - point and click. You need to associate the node with our cloud server application (SolarNet) but then you add a plugin repository, and you can add components like inverters, switches, charge controllers, etc. Do you have a Midnite Classic by the way? we'd love to support those with Modbus connectivity. I do modus over ethernet with our classic, but you can also do it over serial, using the internal rj11s . There were some early teething pains with the controller firmware but thats settled down and works ok. You can read as fast as 100ms intervals if you want.